Smart lighting and shade control, better and brighter than ever! Welcome to your world of bright possibilities and intuitive lighting, fully integrated to create a spectacular, safe and comfortable environment for you to call home. 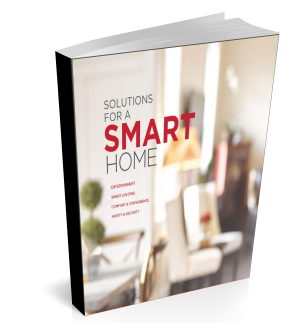 Let’s begin in the heart-of-your-home, the kitchen, where an elegant keypad replaces your unsightly switches. Touch “Cooking” and the lights under your cabinets and over your cook top brightly illuminate, creating a safe place to chop, dice and cook. Press “Dining” and the lights dim, producing the perfect ambiance to enjoy a meal. “Clean Up” brightly lights the kitchen, and “All Off” does exactly what it says. You leave the house for the day, press one button, and all lights in your home shut off. You return home that night, activate the garage door opener, and your path into the kitchen illuminates. Your dinner guests are about to arrive, you press “Entertain,” and the lights dim, the fireplace ignites and the music begins to play. Press “Goodnight” and the lights turn off all over your home. If little ones awake in the middle of the night, smart motion detectors light their way to the bathroom. And if a sound awakens you, press “Panic” and every light in your home goes on while flashing lights are activated outdoors. We also work with Mother Nature, leveraging natural light to save energy. On cold days, automated shade control allows light and sunlight to penetrate your home, while in summer’s heat shades lower to block out the sun’s rays. At night, shades lower to conserve energy and afford privacy. The “Movie” and “Music” controls can be set to create the perfect audio, video and lighting, including lowering the shades and closing the drapes. Spectacular lighting, indoors and out, that’s fully integrated, smart and easy-to-use. Lifetronic Systems also creates striking landscapes, dramatically lighting pathways and patios, pools, glittering fountains and sculptural trees and bushes. You can increase your family’s safety with timers and motion sensors that turn lights on and off 365 days of the year, adjusting to the seasons since they work on the atomic clock. Every button you push is engraved to distinguish the lights you are turning on and the mood that will be created. Plus, each switch is backlighted in a wide range of colors and includes a dimmer to turn off the backlight if you want complete darkness. 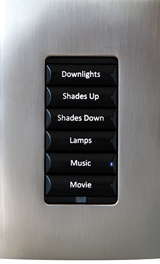 You can even control the lights from a remote control, portable touch-screen, smartphone or tablet. Lighting & Shade Control Systems – Service Areas: Lifetronic Systems is located in Westport, CT, and services all of Fairfield County, CT, and Westchester County, NY, including: Westport, Weston, Wilton, Easton, Redding, Fairfield, New Canaan, Darien, Greenwich, Stamford and beyond. We also travel beyond Connecticut and New York upon request.